I’m having withdrawal symptoms….normally when I get a car to be seen around in, it’s usually a sporty little number worth half a million or something that is top of the range for Millionaires but still at sedan level. And if I do get lucky and get a SUV sent to me, it never fits my shoe rack properly and if it does, there is no space left to organise my gym bag, evening bag, beach bag, magazines etc in such a way that I don’t have to do a major clean up after a dune bashing session. 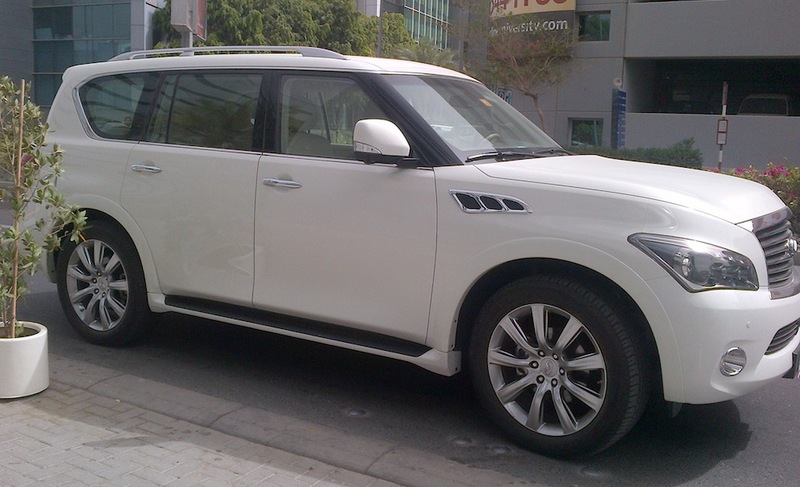 So naturally when Infiniti sent me the nice big Infiniti QX56 on a truck last week, I kinda expected yet another SUV experience but once inside, even I was overwhelmed by the size….its HUGE! It’s fantastic for buyers who need seats for eight although I would have preferred a seat for 5 and then use the rest of the space for the many things a diva can’t do without in her car….i was able to fit in about 45 pairs of shoes on the rack once I rolled the seat over plus all my bags which has never happened before….normally I have to ration what I put into the cars I get to check out. The QX56 is Infiniti’s super big SUV and I like the posh interior, the gracefully styled dashboard and the small touches on the exterior that makes it stand out as an Infiniti. It looked like it has very rugged capabilities but as usual I am never comfortable taking cars off-road that does not belong to me…I like the comfort of knowing that if something happens, its my car and I am solely responsible for it. As a petrol head, I love the Infiniti’s 5.6-liter V8, 400 horsepower and 413 lb-ft or torque funnelled through a seven-speed automatic that gets the throttle to the max. The Infiniti promises a 0-60 mph time of about seven seconds, gas mileage and although people tell me that QX’s independent suspension does a fine job of controlling its ride quality, I had to put in some power into my arms/hands to control it in tight corners….maybe it’s just my delicate built but it was fun none the less. Needless to say, the car is very spacious, with big front chairs and little Diva (NJD) had lots of fun playing at the back and for once she reckons, she didn’t have to bump into the ‘junk’ I normally throw in the back or shoes to fall over. 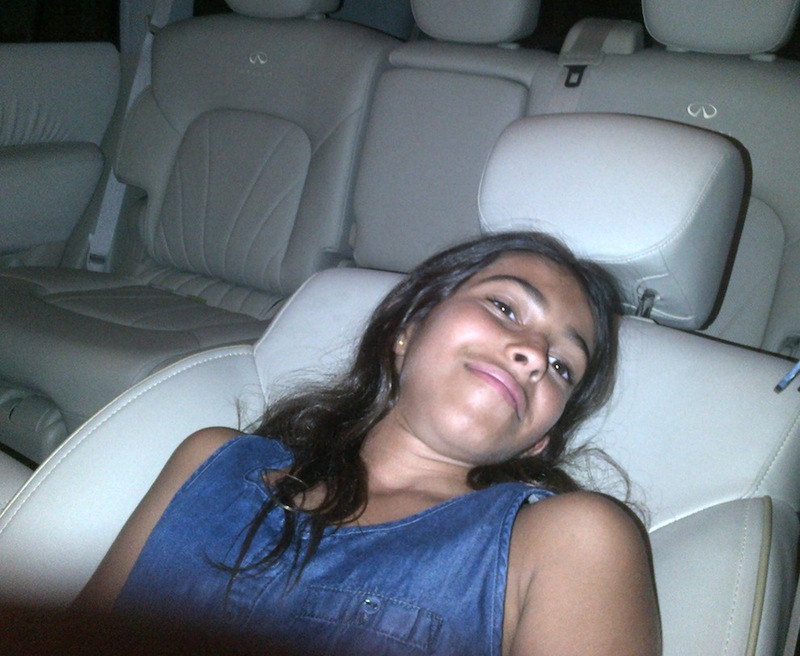 She even reclined the back seat for a nap and showed me some cool features I was not aware of. The car had all the usual power features; navigation option, DVD audio, a moon roof, a power tailgate, Bluetooth with audio streaming, pushbutton start, USB connectivity for audio players and so much more…if you have a big family or like big SUV’s, this is definitely a car for you. 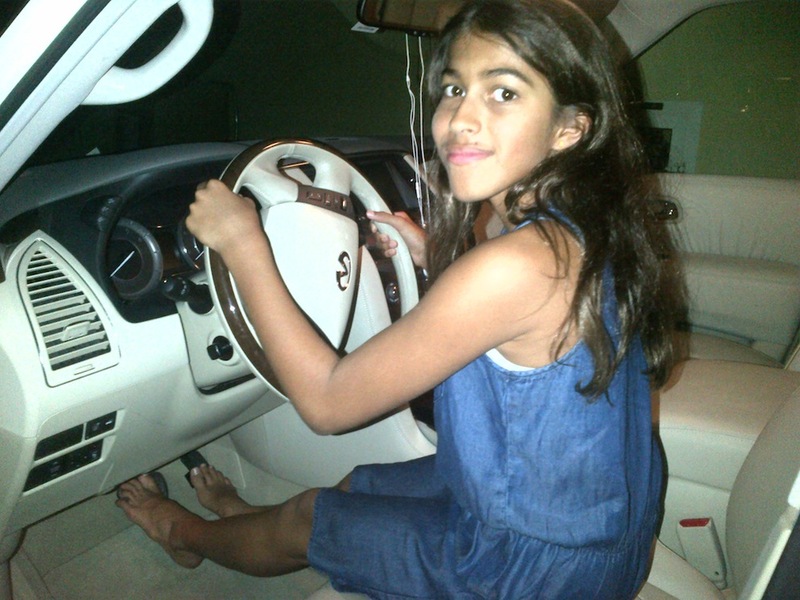 NJD reckons she is ready to drive … 5 more years to go!